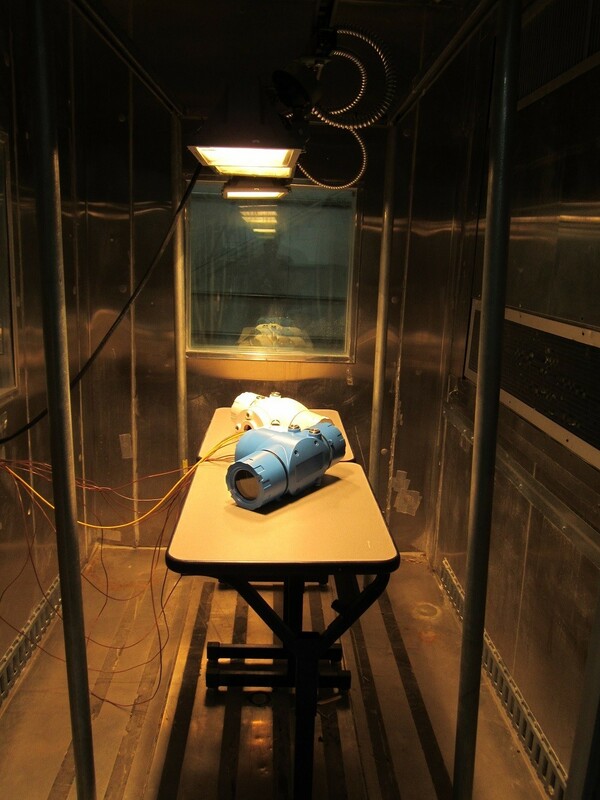 Solar radiation test setups are custom designed for each test setup. Solar arrays can be provided for small or large test articles. Arrays are designed and calibrated prior to placement of the test article. Testing takes place within any of our various temperature chambers. Solar arrays are microprocessor controlled and are capable of delivering greater than the 1,200 watts per meter squared as required by most commonly used test specifications. Custom programs can be designed to simulate real world test cycles of sunrise to sunset. Keystone Compliance offers Solar radiation testing for heating effects only. Solar Radiation setups are unique and tailored to the attributes of the test article. Solar arrays are designed and assembled as required. Microprocessor automation allows for uninterrupted solar radiation testing with precise intensity control. Testing takes place within any of our environmental chambers, allowing for testing of small to large test articles. Our drive in chamber has internal dimensions of 12’ wide x 15’ long x 10’ tall and can be used for solar radiation testing. Solar radiation testing, per MIL-STD 810 Method 505.4, is conducted to determine the effects of solar radiation on equipment that may be exposed to sunshine during operation or unsheltered storage on the Earth’s surface or in the lower atmosphere. The heating effects of solar radiation differ from those of high air temperature alone in that the amount of heat absorbed or reflected depends on the roughness and color of the surface on which the radiation is incident. In addition to the differential expansion between dissimilar materials, changes in the intensity of solar radiation may cause components to expand or contract at different rates, which can lead to severe stresses and loss of structural integrity. Keystone Compliance is a solar radiation test lab. Contact us to determine how we can help you meet your solar radiation testing needs.